VelocePress publishes a wide selection of Clymer manuals and out-of-print technical books, workshop manuals, service, repair and owner's handbooks. Dimensions: 5 3/4" x 8 1/4"
Description:274 pages with 234 illustrations, size 5.75 x 8.25 inches. Packed with hard-to-find detailed information to assist in the overhaul, repair, adjustment and maintenance of pre World War II motorcycle engines. The predominance of the data included in this publication was compiled from 1924 through 1931 service documentation. However, much of that same information is applicable to earlier and later motorcycles that utilize the same engines. Includes information on A.J.S., Ariel, B.S.A., Calthorpe, Douglas, J.A.P., Levis, Matchless, New Hudson, New Imperial, Norton, Panther, Raleigh, Royal Enfield, Rudge, Scott, Sunbeam, Triumph and Velocette engines. IMPORTANT NOTE: As this information was extracted from the various manufacturers service documentation the amount of detail varies considerably. For example, the data on Calthorpe and New Imperial engines are only 4 pages each in length and would be considered to be adjustment and maintenance information only. Conversely, the data on the Scott engine is 15 pages in length and the overhaul process is explained in detail. 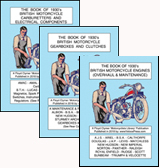 Click here to purchase the three-book set of 1930's British Motorcycle Books (includes Carburetters & Electrical Components, Clutches & Gearboxes and Engines) Buy the complete set and save $10 plus get discounted shipping!